Like a wave, yoga and meditation practice comes with our own personal tide. We get pushed and pulled in different directions and life sometimes brings a big set of obstacles that take us away from routine. I’m so guilty of falling into this trap and even though I’m equipped to practice anywhere at any time, I still ebb and flow. The thing with yoga, in my opinion, is that it comes in and out of life when you need it. 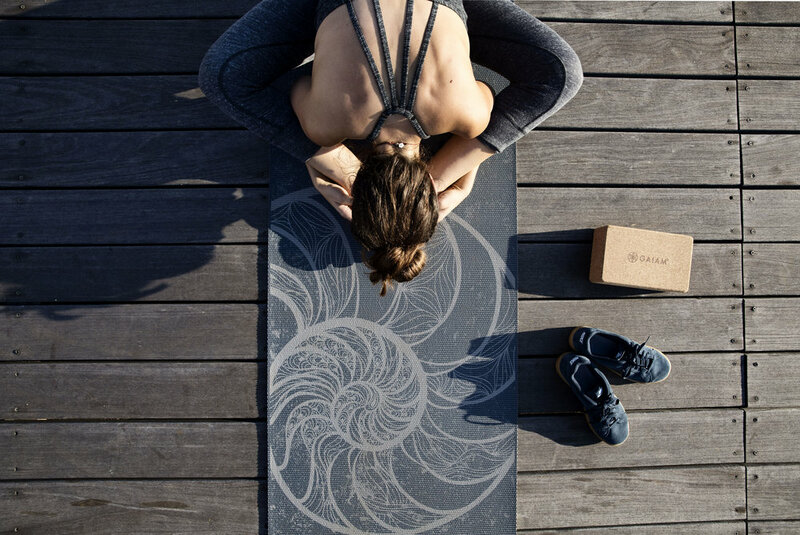 September is National Yoga month so perhaps it’s a really great time to break the shell of bad patterns and emerge with purpose, intention and attention. Natural elements and sound inspiration: These wood earbuds from Gaiam are a nice natural touch and I'll either have a meditation app (I love Inscape) or a playlist to move to. Sometimes I’ll have nature sounds to breathe to, especially if I’m currently in a big city. The mat I totally love because the reversible designs remind me of the sea. Reading yoga texts: I began to pick back up my yoga books and I’m currently readying The Dhammapada. If you’ve already read the Bhagavad Gita, I suggest Eknath Easwaran’s version of this book as well. I'm also about to start The Awakening Body by Reginald Ray for our yoga book club. Extra Support: I’m a really big fan of cork blocks. When I started my Ashtanga practice I used them every single time I hit the mat to help with my flexibility. This Gaiam block is definitely an essential. I also love to put the block under my back as a way to open up my shoulder blades for a nice stretch. If you're building an at home practice then blocks are the perfect piece of equipment to have on-hand. I think cork is better than the foamy ones. I tend to crunch the foam ones and the cork really stands up to strength postures. Cozy Fall-ish Things: Nothing better than practicing and living in something soft for fall. These vintage style Nike cropped sweats are perfect for plane rides, practicing as well as just being cozy at the house. This Gaiam bra is also ultra soft and this sweater is divine. There's no digging in or distracting. Perfect complement for my lifestyle. And last but not least, these Nike suede sneakers are so fall and like little clouds on my feet. I'm excited for the temperatures to drop so I can live in them. Protection: I told you guys about my experience recently with an Ayurvedic doctor gave me a great tip to help ward off bad energy. He told me to carry five cloves in my pocket to protect anything bad to enter my personal sphere. I also just saged the house after fall cleaning. I keep sage, sweetgrass and copal in my yoga room for protection rituals when needed.. I live in New Orleans after all. Lots and lots of energy down here to compete with! Rituals: This is the best time of year to start cultivating comfy rituals. I started making homemade ginger, honey and lemon tea and I’m looking into starting a warm sesame oil skin rub for the mornings. Switching up essential oils, adding candlelight to your practice or reading 20 minutes before bed are all amazing little tweaks to help get us on a good path. Hope this inspires you to move with more intention and purpose this month and thank you Kohl's for being an amazing partner and sponsoring this post.